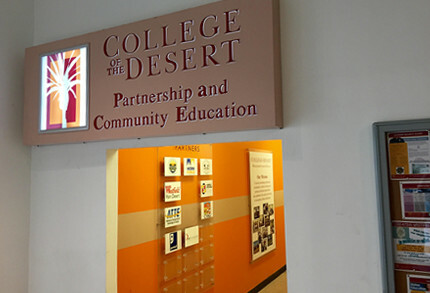 We are located inside the Palm Desert Westfield mall, at PaCE (Partnership and Community Education). PaCE is on the first level of the mall, directly under the food court. Entry can be accessed through the back entrance just east of the World Gym (between the World Gym & Mall Security Office). If you enter through any of the main entrances of the mall you will find us in between the Gap and Victoria’s Secret, behind the escalator leading up to the food court. 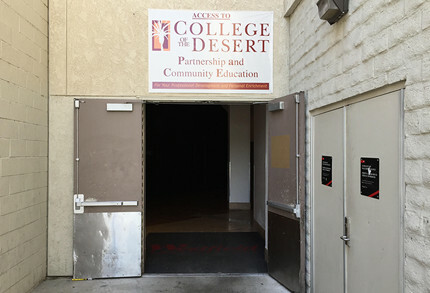 PaCE entrance outdoors, adjacent to the loading area. PaCE entrance inside the mall.